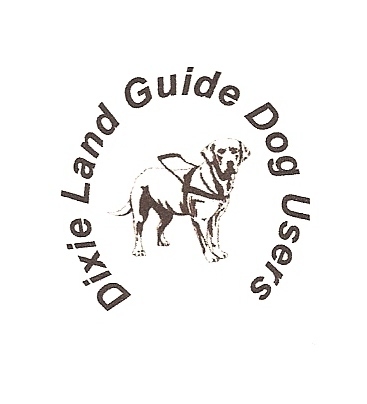 Dixie Land Guide Dog Users: The Magic of Top Dog. The Magic of Top Dog. The kennel was extremely big and unbelievably quiet. All of the older pups were curled up safely in their beds dreaming of breakfast. They'd had a very busy day learning how to be guide dogs and they were understandably tired. The smaller pups were asleep next door. They, too were tired but for other reasons. They'd had the arduous task of running and romping and playing all day-with, of course the frequent licks of appreciation they'd planted on those human volunteers. There was an occasional sound of muffled barks or dancing paws as they relived that day's activities in their sleep. The hour was late and morning would be there soon. Every little pup in that kennel was taking advantage of a much needed rest…except for that certain little yellow fellow with those fetching, big eyes and that adorable smile whenever anyone approached him. All one had to do was to simply call his name and snap their fingers and Jessie's long, lean tail would immediately begin to thump and he'd begin to bounce from one side to another. Jessie couldn't sleep that night. He was just too excited. He'd overheard one of the trainers talking about teaching them to be guide dogs and to be able to travel extensively with their new handlers. He wasn't sure exactly where "extensively" was, but he surely liked the idea of going there one day! Immediately Jessie's nose began to twitch and his tail started thumping the cool concrete kennel floor. All of a sudden, from over in the far corner Jessie thought he saw some sort of figure appear. He needed to go investigate what this was before the others awoke. Cautiously Jessie sort of sidled up to the fog-like presence when the form began to materialize and he found himself nose to nose with a beautiful Labrador retriever donning some sort of special halo-like head dress and sporting a shining long wand. "Ah…who…who are you?" Jessie's curiosity was about to get the best of him. "Hello, little Jessie," the figure replied. "I'm your fairy Guide Mother. My name is One der ful, but you can call me 'One'. "Why are you here, Miss Fairy Guide Mother, One?" "Well, little fellow, you summoned me with the double twitch of your nose and the thump, thump, thump of your tail. You seemed to have stumbled upon the secret code and now I must grant you a wish. So, tell me little Jessie, what would you like your fairy Guide Mother to do for you tonight?" "Well…Miss Fairy Guide Mother One", I overheard the trainers talking about the older guys becoming well-behaved, professionally trained guide dogs and I've decided that's what I want to be. I promise to be really, really good; to do exactly what they say and work very hard. 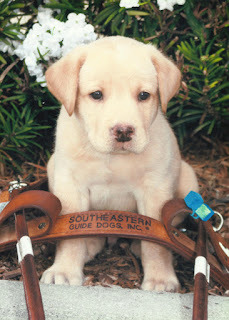 Can you make me a guide dog?" "Oh, Jessie! You silly pup! Of course, I can make you a guide dog and if you work really, really hard like you said, you can be one of the best guide dogs ever!" "Oh, Miss Fairy Guide Mother One, do you think I'll be able to travel to "Extensively" someday? Maybe even get to go to that heavenly place I've heard so many of the big guys talking about called, "Top Dog"?" "Not only will you get to go to Top Dog, Jessie, you'll be part of the inspiration for making Top Dog bigger and better! Pups and peeps from all over the country and beyond will recognize you and you'll even take part in one of the most important events there, called "The Blessing". You'll help your human mom, her friends and yours in planning, preparing and even presenting several Top Dogs, especially when it comes time to honor those newly retired guides and the 2 and 4 legged friends that have crossed 'Rainbow Bridge' All who will have ever attended Top Dog-Charleston, '19 will know your name, little Jessie!" "Oh, Miss Fairy Guide Mother One, I can hardly stand the excitement! Will my person love and care for me like my puppy raiser folks?" "No, little Jessie. She'll love you even more. You two will work together so well and so long that you'll become part of each other!" "Will she let me hold her and sit on her lap, Miss Fairy Guide Mother One?'" "Oh, yes, little Jessie! She will always praise you while you're guiding her safely and she'll absolutely beam with happiness each time you sit in her lap. You two will work together for a long, long time and you'll always-always take very good care of each other! Her heart will open up to you the very first time she touches your head and her love for you will grow stronger with each day's passing. You will soon find that you two were a match made in heaven and a true blessing for one another and the world! She will tell folks that you were sent to her from God, himself." "Oh, Miss Fairy Guide Mother, I am so excited! Please tell me more about Top Dog-'19 and all I can expect when I get there." "It's getting late, little Jessie, and you have lots to do tomorrow if you're going to be a guide dog. However, I can tell you that you will meet lots and lots of new friends there…like, Copper and Astro and Alexa and you will see some of your old buddies, like Houston and Fonzie and Hopps! Lots of people will be there from lots of guide dog schools. In fact, there will be a workshop dedicated to the guide dog schools' updates and how they train their handlers to successfully work such traffic hazards as roundabouts and islands. You will truly share your mom's emotions as she assists in the Blessing and when those puppyraisers begin sharing their experiences raising their charges your little tail will almost wag off your bottom! You'll feel like your little heart will burst with pride when your very own vet begins to talk and answer questions." "Will there be lots for us guide dogs to do there, Miss Fairy Guide Mother, One?" "Silly boy! You'll have your little paws full taking care of your handlers! Remember, little Jessie, they won't be able to see and they'll need you to guide them." "Will there be lots of food there, too?" "Oh, yes! Unfortunately, though, you'll only be able to enjoy the aromas, though. You'll smell that delicious baked spaghetti the first night and your little nose will wiggle almost off your muzzle when you get a whiff of that scrump-ta-dee-li-shus fried chicken, red rice and sausage; green beans and home-made macaroni and cheese on Opening Night! Saturday evening's aromas of Frogmore Stew and Barbecue will tantalize your olfactory nerve beyond your imagination. You'll even be tempted by the delectable scents of those box lunches served Friday and Saturday, but, because you'll be such a great guide and good boy for your mom, you won't even attempt a taste of any of it." "Gosh, Miss Fairy Guide Mother, one, it all sounds so wonderful! I can hardly wait! Tell me again when and where Top Dog-Charleston, '19 will be held." "Well, little man, it sounds like a long time away but it really isn't. It'll be here before you know it, January 18-20, 2019 at the Comfort Suites West of the Ashley, Charleston, SC! So, little man, it's not too early to start preparing! I'll be looking forward to seeing you and all your old and new friends there!" Make your plans to meet Jessie and his friends at Top Dog-Charleston, January 18-20, 2019, Comfort Suites West of the Ashley, 2080 Savannah Hwy., Charleston, SC 29407 (843) 769-9850. Be sure to mention that you're attending Top Dog in order to take advantage of that special nightly rate of $89.95! We look forward to seeing you there! Stay tuned for more details!